The San Diego Metropolitan Transit System is gearing up to serve more than 400,000 passengers during Comic-Con, scheduling more trains and placing a Sci-Fi monster atop a downtown station. “This is an event where transit is key to moving people,” said Paul Jablonski, MTS chief executive officer. He said Green Line trains will run every 7-1/2 minutes from SDCCU stadium to the San Diego Convention Center station from 6:30 a.m. until 11 p.m. throughout the four-day festival. Visitors were encouraged to purchase a five-day pass for $16 using the downloadable MTS app. But Jablonski warned cosplayers to tag their weapons to show they’re safe. 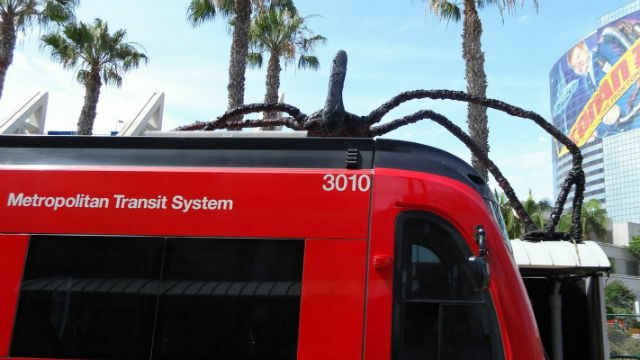 In the spirit of Comic-Con, the transit agency decorated the Convention Center station with a giant model of the Shadow Monster from the Netflix series “Stranger Things.” The work was done by San Diego’s DM Scenic Productions, which has a number of Comic-Con credits. “It’s nice to get involved in Comic-Con and be part of the celebration,” said Jablonski, gesturing to the monster atop the station’s shelter. For the first time at Comic-Con, the city will close Harbor Drive outside the Convention Center for crowd safety, making it harder to drive downtown.